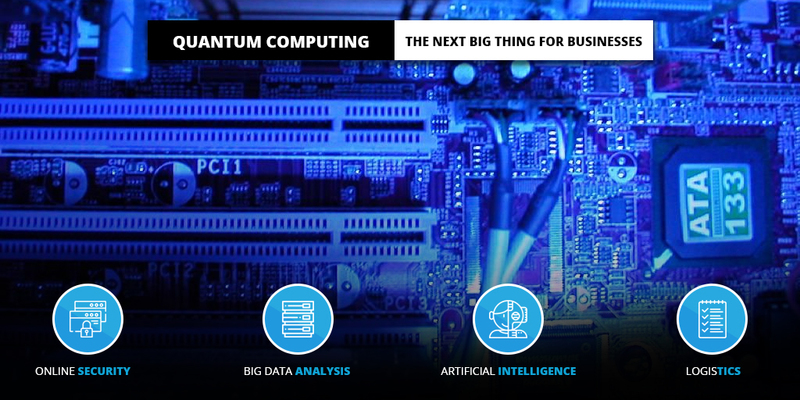 HomeBusiness SolutionsHow is quantum computing the next big thing for businesses? In the times where we are enclosed with data, the need for more advanced and secure systems, more efficient techniques and more ones and zeros to process it has become inevitable. Our very fundamental and familiar computers based on simple binary mathematics are good and quick with regular problems but when the problems are more complex and lengthy then quantum computing becomes the resort. We know that computers work on binary digits called bits. These bits can have two values, either 0 or 1 and these group of bits can only have one state at a given time. Now the bits of quantum computing is called Qubits and can have their value as 0 or 1 or both. Owing to this, the group of Qubits can be in several states simultaneously and thus solve a specific problem much faster and better than a classical computer. For example, if you have to find a word ‘X’ in the library of 50 lacs books in maximum ten minutes than a regular computer just like a normal person will try and go through as many books as possible and show the result whereas a quantum computer will work as if there are 50 lacs people, each looking one book to find that word and thus getting the task accomplished in reality. I am sure, it sounds crazy but this is the kind of multitasking computing techniques that complex industrial scenario demands. Quantum computing is going to have huge implications on every industry in every conceivable way. Let’s see how it resolves the common concerns of businesses. Online Security: Right now online security methods count on the fact that it takes extraordinary time by normal computers to crack the code due to the crunching of large numbers but with quantum computers, the processing of data will be faster leaving behind our personal or professional information vulnerable. Don’t worry, significant work has been done to develop quantum encryption methods to ensure that if a message gets intercepted than no one else can read it. Big data analysis: Analysing large sets of data require significant computing power and quantum computing performs large calculations nearly instantaneously. It has provided new ways of analysing data and is efficient at crunching numbers quickly. While traditional computers will keep plating their roles, businesses must take advantage of it to make the most of their data processing. Artificial intelligence: With methods of information processing and deriving meaning, the advancements in AI has been incredible but quantum computing is set to revolutionise AI also. Quantum computers can quickly analyse data and provide artificial machines with the feedback required to improve the performance or initiate the cation. Quantum computers will help artificial intelligence to expand quickly and technology to become much more intuitive than before. Logistics: Logistics is one of the essential elements of business and truly be revolutionised by quantum computing. For example, While calculating optimal transport route, computers can only analyse one possibility per processor at a time but quantum computing can potentially examine millions of more routes at once. Further, the speed of quantum computing will again play a beneficial role as now it will be possible to calculate a route for every customer’s shipment. While quantum computers will not replace the regular computers, it is quite possible that our future lives and work will be completely dominated by its applications. A Canadian company, D-Wave System is shipping a ten-feet tall quantum computer with a price tag of $15 million and a recent report said that Microsoft has doubled its investment in quantum computing. How to improve your online business bottom line?